Government of the North American colonies by Britain was theoretically through Parliament in the eighteenth century, but King George III did his best to ensure a series of cabinets which looked to him for direction and policy. In 1765, the leader of the cabinet, George Grenville, attempted to regain favour with the king by lowering domestic taxes at the expense of the British Colonies, introducing the Stamp Act. The laws gave rise to widespread protests in America where a small but well-organised radical element emerged. Even so, this element was without general support even when the protests boiled over into the first years of the War of Independence. Feeling in Britain was also mixed, with William Pitt (the Elder) putting forward the case that the colonies should not be taxed because they had no right to representation in parliament (hence the later cry of no taxation without representation). Outside of the colonised regions, the European settlers in North America coined the phrase 'Indian' or 'Red Indian' to describe the Native North American tribes they found. 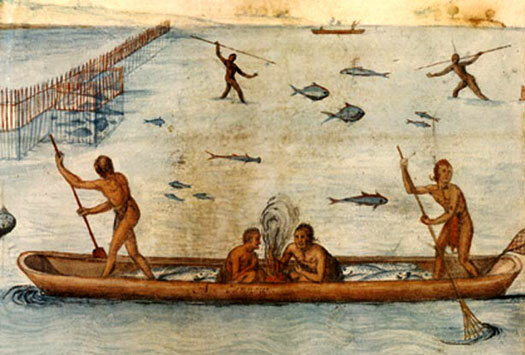 To the north of this vast collection of varying regions and climates and tribes were the native settlements of what is now Canada, while to the south were the various peoples of modern Mexico. More background information on these native tribes is available via the compendium link, right. The Continental Congress was the provisional government of the British Colonies' rebellious subjects. The body of delegates which formed it spoke for the people of the colonies. The First Continental Congress was formed in September 1774, before the opening of hostilities in the war, with a convention of delegates that was administered by a presidential position which was largely impartial and intended to be ceremonial for the most part. It was unrelated to the later post of US president. The First Congress met between 5 September to 26 October 1774 in Philadelphia and consisted of delegates from twelve of the thirteen colonies. Georgia did not send a delegate. However, the situation was already so tense that, before the Second Continental Congress could assemble in the Pennsylvania State House, hostilities had already broken out between Americans and British troops at Lexington and Concord in Massachusetts. New members of the Second Congress included Benjamin Franklin and Thomas Jefferson, while John Hancock and John Jay were amongst the serving presidents. The Congress 'adopted' the New England military forces that had converged upon Boston and appointed Gneeral Washington as commander-in-chief of the American army on 15 June 1775. President of the First Congress, Sep-Oct.
After a meeting with the 'Patriots' of the Continental Congress at Boston in April, Captain Hendrick Aupamut of the Mahican decides not to follow the advised path of neutrality in the approaching war and instead joins the rebels. Nimham's Wappinger follow suit. The Stockbridge Mahican are one of the few tribes to support the independence cause during the war. Between September and October, the First Congress considers its options and petitions King George in Britain for the redress of colonial grievances which had accumulated since 1763. In an effort to force compliance, it called for a general boycott of British goods and the eventual non-exportation of American products, except rice, to Britain or the British West Indies. Its last act is to set a date for another congress to meet on 10 May 1775, to consider further steps. Second term, May only. Died Oct 1775. With the petition of 1774 having been ignored, a Second Congress is confirmed for 10 May 1775 in order to organise an armed resistance to the king's administration in the colonies. 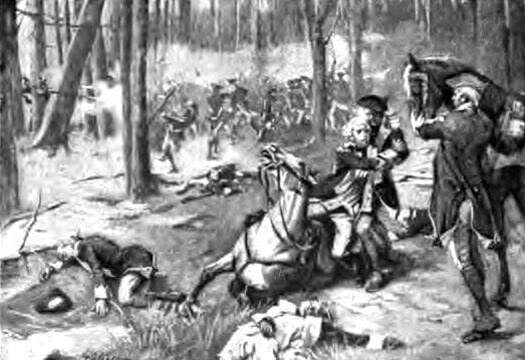 The first blood to be shed is at the Battles of Lexington and Concord on 19 April 1775. The British win both, as well as successfully defending West Florida. General George Washington is appointed commander of the Continental (rebel) field army in July. The onset of open hostilities hobbles the growth of population in British Florida and the expansion of trade that this might bring. American privateers further hamper the flow of goods and immigrants to British territories. On 15 June, in anticipation of coming events, the colonial assembly of Delaware declares itself to be separate from British rule. On 4 July 1776, Britain's remaining twelve eastern colonies in North America make a public declaration of independence, and in revenge for the British seizure of Havana in Cuba in 1762, the Spanish governor of Louisiana supplies gunpowder to the revolutionary forces. The Stockbridge Mahican and Nimham's Wappinger also join the fight on the Congress side. In July, delegates in Vermont declare independence from Britain and from land claims made by New Hampshire and New York. On 11 September 1777, British forces decisively beat General George Washington at the Battle of Brandywine, which leaves the capital of the revolutionary forces, Philadelphia, undefended and subsequently occupied. The Battles of Saratoga in 1777 end first with a stalemate (on 19 September) and then a defeat for the British (7 October), a turning point in the war. After being visited by a deputation of American diplomats, Benjamin Franklin and Silas Deane, France declares war on Britain in support of the rebellion, only too glad to make the most of Britain's misfortune. In June the British forces pull out of Philadelphia to help defend New York. Also in 1778, the apparent immunity of the West Florida province disappears when James Willing of the Continental navy launches a raid through the province's back door, the Mississippi. Meeting almost no resistance, his force of about a hundred men destroy many plantations in the colony's western districts. Although his success is short-lived, and Willing soon sees the inside of a British jail, his achievement alerts the British crown to West Florida's vulnerability, and extra troops are brought in. 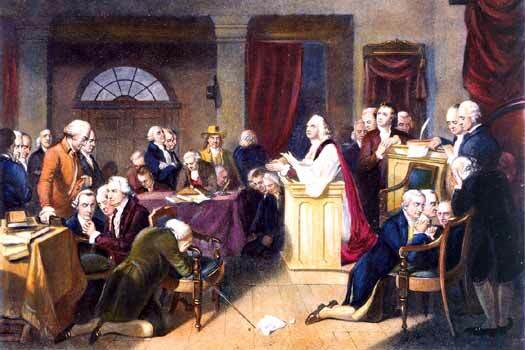 On 1 March, the Continental Congress is succeeded with immediate effect by the Congress of the Confederation. 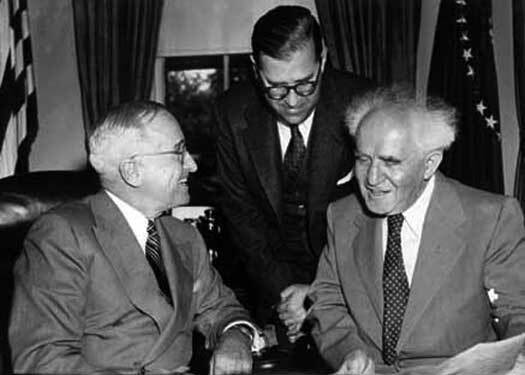 Samuel Huntington remains its president and all other members remain in place. The Congress of the Confederation was created with the ratification of the Articles of Confederation, the first constitution for what was becoming a new nation. 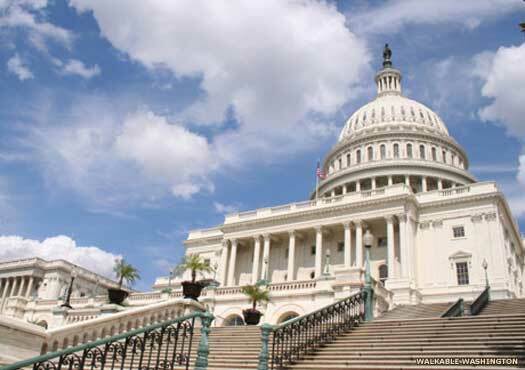 Otherwise known as the United States in Congress Assembled, the congress was the governing body for the thirteen North American colonies during the last years of the war against Britain and the first years of independence. The capital was established in New York between 1785-1790 but the congress excluded Vermont, which remained independent until 1791. This congress consisted of the same members as the previous one, and with the same limited powers - the important powers of taxation and policy-making remained with the individual states so that the weak congress presided over a decade of economic instability, social unrest, and class conflict. The Treaty of Paris in 1783 marked the end of the War of Independence in the British Colonies. In it, Britain agreed to withdraw from the thirteen colonies on the lower eastern seaboard of North America and also cede its colony in Florida back to Spain. The Congress of the Confederation was replaced in 1781 by the United States Congress which adopted the US constitution and began the form of US governance which continues to the present day. Although the new nation eventually chose a national anthem that is one of the hardest to sing with any conviction, it also uses as a patriotic melody - 'My Country 'tis of Thee/Sweet Land of Liberty' - to the tune of modern Britain's 'God Save the Queen'. 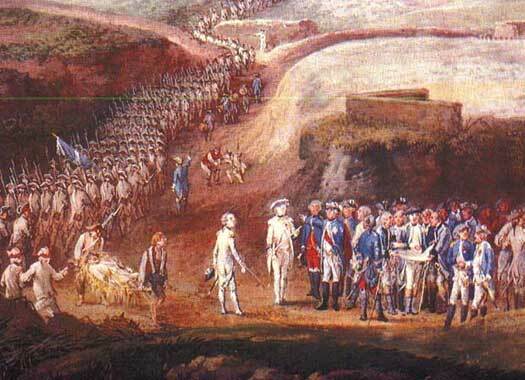 The joint French and American army wins the Siege of Yorktown, Virginia, between 28 September and 19 October 1781. It is the last major land battle in the War of Independence, and the surrender of General Lord Cornwallis and his Hessian allies prompts Britain towards the path of a negotiated peace settlement. New York remains occupied. In March, a Delaware war party which is returning from a raid in Pennsylvania passes through Gnadenhuetten on its way back to northern Ohio. Close on their heels are a hundred-and-sixty American Pennsylvanian volunteers from Washington County, Pennsylvania, under Colonel David Williamson. Finding the Moravians at Gnadenhuetten, Williamson places them under arrest. In the democratic style of frontier militia, a vote is taken as to whether to take the prisoners back to Fort Pitt or kill them. The decision is to execute them. The Moravians are given the night to prepare, and in the morning, two slaughter houses are selected. Ninety Christian Delaware - men, woman and children - are taken inside in small groups and beaten to death with wooden mallets. Word of the massacre spreads to the other Delaware, and in June they join the Wyandot to defeat a large force of Pennsylvania militia (at the Battle of Sandusky). The commanding officer, Colonel William Crawford, suffers a slow, terrible death (being burned at the stake) to atone for the Gnadenhuetten Massacre. The Pennsylvania Mutiny in June 1783 involves revolutionary troops (known collectively as the Continental Army) protesting at their lack of pay from the government of the First Republic. The government refuses to listen and instead withdraws from the city, heading first for Princeton, New Jersey, until November 1783, and then Anapolis, Maryland. Thomas Mifflin signs the Treaty of Paris which recognises the end of the American War of Independence and the sovereignty of the United States of America. Britain withdraws its troops and Hessian allied units from the thirteen former colonies but still remains in control of various territories within the British Colonies. At the same time, while American merchant vessels had been protected from raids in the Mediterranean by the Barbary pirates of Algiers during the war, thanks to its alliance with France, they lose that protection with the ending of the Treaty of Alliance. Subsequently, US merchant shipping continually falls foul of successive pirate raids in the Mediterranean, launched from Morocco and Algiers. Despite diplomatic efforts, large payments of tribute are demanded for the release of captured American crews, and the US regularly pays up to a million dollars a year to ensure the safe passage of its ships. The government of the republic moves from Anapolis to Trenton, New Jersey, in November 1784, before finding a new home in New York City in January 1785. Fighting occurs the same year in Ohio and Indiana under the title of the Old North-West War. Following two humiliating defeats at the hands of native warriors, the Americans win a decisive victory under 'Mad Anthony' Wayne at the Battle of Fallen Timbers in 1795. The post is vacant between November 1786 and February 1787. 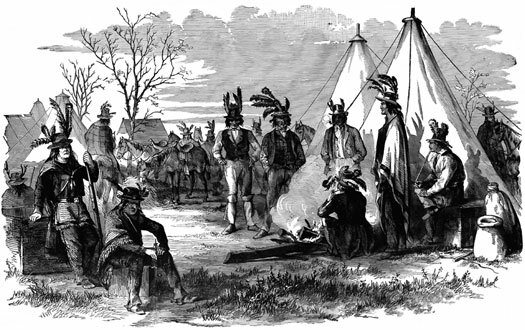 Butat the same time, despite having rendered valuable service to the American army during the Revolutionary War, the Oneida, Brotherton, and Stockbridge Indians slowly lose their lands to New York land speculators. The first capitol of their Western Alliance is at the Shawnee village of Wakatomica, but this is burned by the Americans in 1786. The council fire is moved in November to Brownstown, a Wyandot village which lies just to the south of Detroit. On 17 September 1787, the constitution of the United States of America is ratified. Almost immediately the first three of the former colonies of Great Britain are admitted into the Union. On 7 December 1787, Delaware becomes the first state to join the Union. On 12 December 1787, Pennsylvania is the second, while on 18 December 1787, New Jersey becomes the third state. Admitted to the Union are eight more of the thirteen former colonies of Great Britain. On 2 January 1788 Georgia becomes the fourth state. On 9 January, Connecticut becomes the fifth state. On 6 February, the Commonwealth of Massachusetts becomes the sixth state. On 28 April, Maryland becomes the seventh state. On 23 May, South Carolina becomes the eighth state. On 21 June, New Hampshire becomes the ninth state. On 25 June, Virginia becomes the tenth state. On 26 July, New York becomes the eleventh state. On 2 November, the Congress of the Confederation is abolished, no longer required now that the new US constitution has been signed. 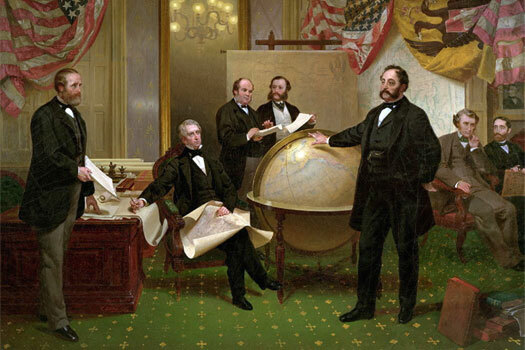 The Congress of the Confederation is succeeded by the United States Congress, to be headed by a democratically elected president instead of ceremonial presidents. It meets for the first time on 4 March. The new government was organised by a new federal constitution, to be headed by a democratically elected president, unlike the previous ceremonial presidents of the Continental Congress and the Congress of the Confederation. General George Washington was sworn in as the first president of the United States on 30 April 1789. His family name already bore an element of notoriety as his great-grandfather, Colonel John Washington, had led an armed mob against some of the Susquehannock survivors in Maryland, wrongly as it turned out and against the governor's express orders. The independent American government was returned to Philadelphia in 1790, after voting on the creation of the District of Columbia on the banks of the Potomac River between the states of Maryland and Virginia. It took ten years to make the new city ready for occupation, and on 14 May 1800 the US government moved for the last time to its new and permanent home. When tracing the birth of the First Amendment to the constitution, the most logical place to start is with Thomas Jefferson, James Madison, and the other 'Founders'. The basis of religious liberty in America went back much further than this, beginning in the early debates. The core idea behind the First Amendment - that the government should never interfere with an individual's freedom of conscience - came from Roger Williams. He was the first to use the term, 'the separation of church and state' (discussed in more detail in the linked feature). (Information by Peter Kessler, with additional information by Edward Dawson and Bruce T Murray, from Theology in America: A Historical Survey, Sydney E Ahlstrom (Princeton University Press, 1961), from Pilgrims in Their Own Land, Martin E Marty (Penguin Books, 1984), and from The First Liberty: Religion and the American Republic, William Lee Miller (Paragon House Publishers, 1985). Served two terms. Died of a throat infection 14 Dec 1799. On 21 November 1789, North Carolina joins the Union as the twelfth state (making it one of the very last remaining former British Colonies to do so). On 29 May 1790, Rhode Island and Providence Plantations join the Union as the thirteenth state (first sighted in 1524 by the Italian explorer, Giovanni da Verrazzano, while in the employ of France, the area had subsequently fallen under the administration of the British Colonies). In the same year, with the the Treaty of Fort Harmar (of January 1789) proving worthless, the Americans decide to resolve by force the problems with native American unrest in Ohio. Faced with another war, the Moravian Delaware leave Ohio for southern Ontario. Known as the 'Moravians of the Thames', by 1792 they establish themselves in a peaceful community at Moraviantown (unfortunately burned to the ground by an American army in 1813). Little Turtle's War (1790-1794) begins with a series of disasters for the Americans as they attempt to destroy the native American alliance villages in north-western Ohio. Josiah Harmar's army of militia is ambushed on the upper Wabash in 1790, and it suffers over two hundred casualties. On 4 March 1791, the Vermont Republic joins the Union as the fourteenth state (probably first sighted by Jacques Cartier in 1541 as he claimed Canada for France, Vermont was also claimed as part of New France in 1609, passing to Britain in 1763 and then to the US). In the ongoing conflict in Ohio, Arthur St Clair suffers an even greater humiliation - the worst defeat ever to be inflicted on a fledgling American army by Native Americans, leaving six hundred dead and four hundred wounded. An enraged President George Washington at Philadelphia finally calms down and sends 'Mad' Anthony Wayne to Ohio. Wayne establishes himself at Fort Washington (in modern Cincinnati) and, during the next two years, he makes careful preparations to destroy the alliance. 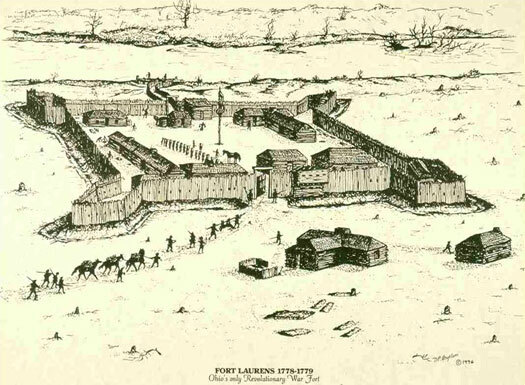 While a line of forts is built which aims its line directly at north-western Ohio, Wayne trains a 'legion' of disciplined regulars to back-up the militia. Meanwhile, the prolonged war is causing the alliance to disintegrate. On 1 June 1792, the Commonwealth of Kentucky joins the Union as the fifteenth state (originating as part of Virginia from around 1750, it is only at this date that it is separated). On 1 June 1796, Tennessee joins the Union as the sixteenth state (first explored by the Spanish in 1540, 1559, and 1567, the first settlement only appeared in 1756, when Britain constructed Fort Loudoun). On 19 February 1803, Ohio joins the Union as the seventeenth state (originally entered by fur traders from New France, it had been passed to Britain in 1763 and then the US in 1783). On 30 April 1803, Napoleon Bonaparte, first consul of France, sells the New French territory of Louisiana to the United States for 80 million francs. While the USA also claims the former French territory which has been part of West Florida since 1763, Spain refuses to hand it over. The following year the Orleans Territory is formed as a subdivision of part of it (later to become the state of Louisiana). In 1806, the USA asks the viceroy of New Spain to remove his troops from New Orleans so that it can take possession of the area up to the River Sabine. The Spanish agree and the troops are removed. The importation of slaves is banned by the 'Act Prohibiting Importation of Slaves of 1807'. American slaveholders start breeding their own slaves on the plantations in the South. On 27 October, parts of West Florida are annexed by the USA, which claims the region as part of the 1803 Louisiana Purchase. US forces take control of the republic of West Florida's capital of St Francisville on 6 December, with Baton Rouge falling four days later. Spain continues to protest at the illegal capture but is unable to regain the territory. Louisiana is formally accepted as a state of the Union on 30 April 1812, the eighteenth to be created, and the first to officially declared as such. 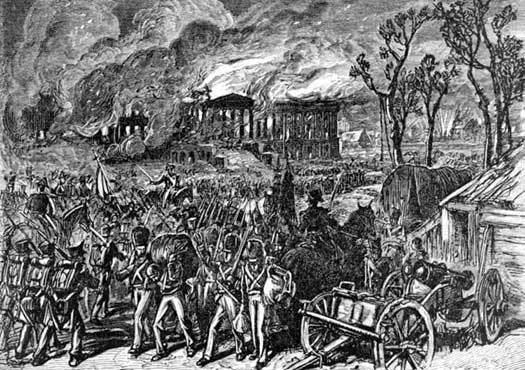 The War of 1812 begins as the US declares war on Britain over the interdiction of trade with Napoleonic France. The American push to colonise Canada is repulsed several times by British and native American forces, leading to US defeat. In Florida, the area around Mobile (Alabama) is officially annexed to the Mississippi Territory (in 1814), and the captured territory is slowly increased in size over the next few years. In the north, the 49th parallel is established as the border between the Rupert's Land British Colonies and the US west to the Rocky Mountains. The Red River Colony is ceded to the US and joint control of Oregon Country is commenced. On 11 December 1816, Indiana is admitted into the Union as the nineteenth state (New French territory from 1679 to 1763 and then a territory of the British Colonies between 1763-1783, it had been handed over to the US to form part of the Northwest Territory. In 1800, the Indiana Territory was formed after Ohio had been separated). On 10 December 1817, Mississippi is admitted into the Union as the twentieth state (the Spanish passed through in 1540, but the first colony had been established under the administration of New France in 1699 as part of the Louisiana Territory, and then changed hands between Spanish, British, French (up to 1763), then becoming part of the British Colonies and then the Mississippi Territory of the US). On 3 December 1818, Illinois is admitted into the Union as the twenty-first state (formerly part of New France from around 1673-1763 and then a territory of the British Colonies between 1763-1783, it had been ceded by Virginia to the new US Northwest Territory in 1783, with the Illinois Territory being created on 3 February 1809). With the USA keen to support the rebels in New Spain, it signs the Adams-Onis Treaty with Spain on 22 February 1819. This establishes the border between the two countries, with the US gaining Alabama and Florida (the latter following a US 'invasion' in 1816 during the prelude to the First Seminole War), and renouncing its claim to Texas, while Spain renounces its claim to Oregon. On 4 July of the same year, the Territory of Arkansas is organised. On 15 March 1820, Maine is admitted into the Union as the twenty-third state (originally the location for the Roanoke and Popham colonies of the British Colonies (1586 and 1607 respectively), the province of Maine had been created in 1622, and passed into US hands in 1783). On 10 August 1821, Missouri is admitted into the Union as the twenty-fourth state (the first settlers here had been existing settlers from New France by about 1750 and it remained part of the Louisiana Territory which had been acquired by the US in 1803). Eldest son of John Adams (1797-1801). Massachusetts. King John VI of Portugal, under pressure from Britain, recognises the independence of Brazil after the USA has already done so. Mexican troops massacre the Texan garrison at the Alamo, an event that enters US mythology. Despite the defeat, the north-eastern core of Texas becomes independent. 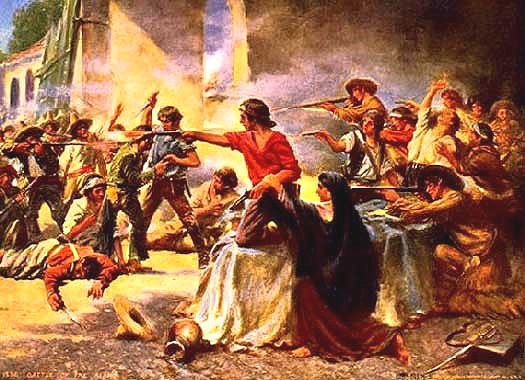 The following year a US army surprises the Mexican forces in an eighteen-minute fusillade and charge, spurred on with cries of 'Remember the Alamo!' Also in 1836, on 15 June, Arkansas is admitted to the Union as the twenty-fifth state. On 26 January 1837, Michigan is admitted into the Union as the twenty-sixth state (initially explored by the French in 1622, and drawn into New France, it became a possession of the British Colonies in 1763). New York. A founder of the Democrat party. Whig. Died 4 April of pneumonia. First president to die in office. The US annexes the remainder of Texas and triggers the Mexican-American War (or simply the Mexican War), in which it is successful. Under the terms of the Treaty of Guadalupe Hidalgo, the US also gains Arizona, California, Colorado, Nevada, New Mexico, and Utah. On 29 December 1845, Texas joins the Union as the twenty-eighth state. Britain, which still holds much of the disputed territory of Oregon, is persuaded not to intervene by the 1846 agreement called the Oregon Treaty which divides the territory along the 49th parallel. Britain keeps Vancouver to the north of the line (British Columbia), while the US gains Seattle to the south (Washington and Oregon), plus Iowa, which is admitted into the Union on 29 December as the twenty-ninth state. The signing of the Bidlack Mallarino Treaty between New Granada and the USA ensures that Panama will remain within the South American republic, with both parties joining together to put down liberalist attempts to create an independent state, and with the USA gaining rights to build railways and roads through the isthmus in return. On 29 May 1848, Wisconsin is admitted into the Union as the thirtieth state (first explored by Frenchman Jean Nicolet in 1634, his Green Bay colony had been settled mainly by fur traders. That had passed to Britain in 1763 and technically to the US in 1783, although Britain remained in control until the War of 1812). Whig. Died in office, 9 July 1850, after eating cherries and milk. For some time, no US ship has been allowed to put in at Japanese ports, and shipwrecked American sailors are regularly dispatched to prevent them from polluting the isolated Japanese culture. Commodore Matthew Perry is sent to Japan with a fleet of ships and arrives on 8 July to force Japan to end its period of isolation. 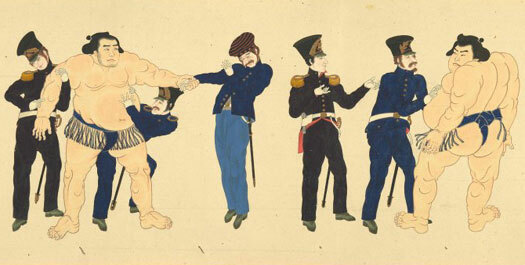 This act leads shortly to the ending of the Shogunate. President Pierce recognises the legitimacy of the government of US adventurer, William Walker, after he seizes control of Nicaragua. In the same year, Pierce is persuaded by Walker's enemies to withdraw recognition of his government. 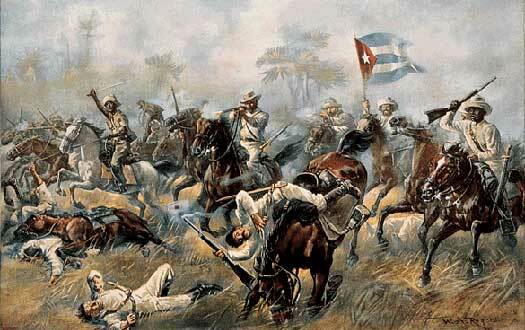 He has already been defeated by Costa Rican and mercenary forces in the Second Battle of Rivas. He soon surrenders and is repatriated back to the USA. On 11 May 1858, Minnesota joins the Union as the thirty-second state (first entered by French fur traders in the seventeenth century, most of it had remained part of New France until the Louisiana Purchase of 1803, although the land on the eastern side of the Mississippi had become part of the US at the signing of the Treaty of Paris in 1784). On 14 February 1859, Oregon joins the Union as the thirty-third state (the first explorers had been Spanish in the late seventeenth century and British explorers followed in the eighteenth century. The territory had subsequently been passed onto the US). On 29 January 1861, Kansas is admitted into the Union as the thirty-fourth state (first explored by Spain in 1541, it had been transferred to US control as part of the Louisiana Purchase of 1803, and formed part of the Missouri Territory between 1812-1821). Within a few months of Lincoln's accession, the southern states break away from the union, forming their own confederacy. The American Civil War breaks out, and Gettysburg, the largest battle ever fought on the American continent, ends in victory for Union forces in 1863, the same year in which the US annexes the Honduran Swan Islands. The civil war comes to an end in 1865, with the exhausted south unable to fight on. On 20 June 1863, West Virginia is admitted into the Union as the thirty-fifth state (contested territory between Pennsylvania, Virginia, and various land companies, it had remained a strongly secessionist western part of Virginia until that succession had been formalised in 1863, followed swiftly by incorporation). On 31 October 1864, Nevada is admitted into the Union as the thirty-sixth state (situated in the far west, the [Sierra] Nevada Territory had separated acrimoniously from the Utah Territory and its predominantly Mormon population in 1861). The United States senate reluctantly votes to purchase Alaska from Russia for just US$7.2 million. Czar Alexander of Russia allows this because he fears that the British in Canada will invade and seize it. In Canada and Britain the act is seen somewhat differently, as a threat to Britain's Pacific coast colony. Also in 1867, on 1 March, Nebraska is admitted into the Union as the thirty-seventh state (beyond the colonial settlement area, the Nebraska Territory had been created in 1854). Republican. Ex-general. Served two terms. The president of the Dominican Republic bids to have his country annexed to the USA. He has the support of the president, but the bid is derailed by the American Senate, by just one vote. Republican, Ohio. Pledged not to run for re-election. Republican, Ohio. Assassinated 19 September 1881. Republican, New York. Became a staunch reformer. Democrat, New York. First term of office. On 2 November 1889, both North Dakota and South Dakota are admitted into the Union as the thirty-ninth and fortieth states respectively (first entered by French traders in 1738 but not settled by the time of the Louisiana Purchase of 1803, much of the joint territory had been part of the Minnesota and Nebraska territories until 1861). On 8 November 1889, Montana is admitted into the Union as the forty-first state (never settled, it had been part of the Louisiana Purchase, after which it had been first explored by Lewis and Clark in 1804-1806, and became the Montana Territory in 1864). On 11 November 1889, Washington is admitted into the Union as the forty-second state (again never settled, it had been disputed territory between Britain and the USA until the Oregon Treaty divided the region along the 49th parallel in 1846). On 3 July 1890, Idaho is admitted into the Union as the forty-third state (created as a portion of the Oregon Country in the north-west of the modern USA, it had become undisputed US territory following the Oregon Treaty of 1846, and had been separated as the Idaho Territory in 1863 out of parts of the Dakota, Oregon, and Washington Territories). On 10 July 1890, Wyoming is admitted into the Union as the forty-fourth state (possibly entered by a few French fur trappers, the region had not been properly explored until the Lewis and Clark expedition of 1804-1806). Re-elected but badly damaged by the 'Panic of 1893'. On 4 January 1896, Utah is admitted into the Union as the forty-fifth state (situated in the far west, the Utah Territory had lost the [Sierra] Nevada Territory in 1861 when the latter's populace decided to break away from Utah's predominantly Mormon population). Republican, Ohio. Assassinated 6 months into second term. Spain loses the Spanish-American War. With that it also loses much of the Spanish Caribbean, including Cuba, Puerto Rico, and the Spanish East Indies (including the Marianna Islands and the Philippines). It has to sell the Philippines to the USA. The US also supports the newly independent republic of Cuba in 1899-1902 by supervising its finances and foreign affairs, and reserving the right to intervene in its affairs. Cuba also agrees to lease the naval base at Guantanamo Bay to the US. Republican, New York. Former vice-president. Served two terms. The USA decides to take control of and complete the abandoned French work on the Panama Canal. The Colombian government is naturally reluctant to allow that level of control to fall outside its hands and refuses permission. The US decides to support Panamanian demands for independence and in 1903, the isthmus separates and becomes the republic of Panama, with a small US military force preventing Colombia from sending troops by sea to regain the territory. The Cuban elections of 1902 are disputed and lead to a revolt and US intervention. US provisional governors take charge of Cuba for three years (the first being William Howard Taft, soon to be US president), before an elected government resumes Cuban control of their affairs, but the US retains its right to intervene. On 16 November 1907, Oklahoma is admitted into the Union as the forty-sixth state (first entered by Spain in 1541, the region had been claimed by New France in the eighteenth century and passed into US hands in the Louisiana Purchase of 1803). Republican. Former 1st provisional governor of Cuba. Following an insurrection in Nicaragua, the US asks the president to ensure that all its citizens are protected, something that he is unable to guarantee. As a result, US Marines occupy the country and remain there until 1933, apart from a nine month period in 1925. Alaska becomes an organised territory on 11 May of the same year. On 6 January 1912, New Mexico is admitted into the Union as the forty-seventh state (first explored by the Spanish in 1540-1542, most of it became the province of New Mexico within New Spain in 1598, and then an independent Mexico before being handed over in portions to the US between 1848-1853). Democrat, New Jersey. Served two terms. The Panama Canal is opened by its US builders and owners, despite it being signed over to them by a French citizen in Panama in 1903 who had no authorisation to do so. 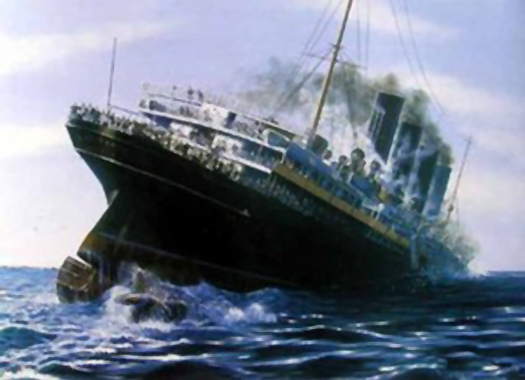 A German U-boat sinks the SS Lusitania on 7 May, killing 1,198 and inflaming anti-German feeling in the US. However, Woodrow Wilson has no intention of bringing his country to war and actively works to bring the combatants to the negotiating table. There is a large proportion of the US population which is of German descent and many of these campaign through the German-American Bund to keep America neutral. Instead, the USA occupies Haiti in the Caribbean in an attempt to stabilise the political situation there. The USA occupies the Dominican Republic in an attempt to stabilise both that and Haiti and impose lasting governments. US Marines land on 19 May 1916 and within three months they secure effective control of the country. In November the USA proclaims a military government, but the marines soon find they have to fight a determined guerrilla action in the east of the country, led by Vicente Evangelista. In 1917, two events change the US stance on involvement in the First World War. Firstly, Germany makes a clumsy attempt to involve Mexico by promising Texas, Arizona, and New Mexico if the US joins the Allied side in the war. Secondly, and more telling, is Germany's decision to return to unrestricted submarine warfare, sinking American as well as Allied ships. Congress agrees to declare war against Germany on 6 April 1917, with declarations against Austria-Hungary, Turkey, and Bulgaria following soon afterwards. Mobilisation begins, but it is only in 1918 that the American weight of numbers and materials begins to make a difference on the Western Front in France. More locally, between 1917-1919, the USA supports the deposed government of Costa Rica in the face of harsh repression by dictator Federico Tinoco Granados. Republican, Ohio. Died in office while visiting San Francisco. The Harding Plan effects a gradual withdrawal of US forces from the Dominican Republic and a return to local control, but Haiti remains occupied until 1934. Unfortunately for President Harding, he dies just a year later, and his vice-president has to take over. 30th president. Completed Harding's first term and served second. When a new, liberal government is installed in Nicaragua, the US finally withdraws its troops who have been there since 1912 and who have been targeted by guerrilla attacks during the last years of the previous government. Democrat. 5th cousin of T Roosevelt. Served over three terms. The USA joins the Second World War on 8 December 1941, initially against Japan, then as an ally of Great Britain against Germany and Italy, with Mexico supplying raw materials as one of the allied nations in opposition to the Axis powers. Democrat, Missouri. Served two terms. Republican. Ex-army general. Served two terms. The elected president of Guatemala is overthrown in a coup which is backed by the USA. With the Cold War between the USA and Soviet Russia at its height, the US government supports Guatemala with arms and funds. Israel occupies the Sinai peninsula as part of its efforts against Egypt in the Suez Crisis. While its objectives are achieved as part of an agreement with France and Britain, Israel is pressured into withdrawing by the United Nations and even more especially by the USA, which fails to support any of its allies in this affair. Alaska becomes the forty-ninth US state on 3 January 1959, while Hawaii follows as the fiftieth state on 21 August. Also from this year onwards, US forces help to prop up the local government during the Vietnam War, or Second Indochina War, but they are unable to prevent communist forces from the north from gaining overall control. Democrat, Massachusetts. Assassinated 22 November 1963. An invasion of Cuba on 17 April 1961 by US-trained Cuban exiles, backed by the CIA, fails in the Bay of Pigs when the force runs out of materials. One immediate result of the Cuban-Soviet alliance had been the placement of ballistic missiles on the island, and this precipitates the Cuban Missile Crisis in 1962. The USA 'blockades' Cuba, and only a last-minute climb-down by the Soviets avoids the spectre of nuclear war. Democrat. Completed Kennedy's first term & served a second. The issue of the US ownership of the Panama Canal has long been contentious, but on 9 January it reaches boiling point on what becomes known as Martyr's Day. The riots start after a Panamanian flag is ripped during a dispute between the Canal Zone Police and Panamanian students about flying the flag alongside the American stars and stripes. Three days of fighting follow, with the US military becoming involved in regaining control of the canal. The US congress approves the Gulf of Tonkin Resolution on 7 August 1964, increasing American military involvement in Vietnam. Otherwise known as the South-East Asia Resolution, it is a response to the eponymous fire-fight on 2 August 1964 between US naval forces which have been engaged in clandestine attacks on North Vietnamese installations and three Vietnamese gunboats which fail utterly to scare them off. The political spin of the incident is enough to win almost universal backing for increased US action in what is now a war in all but name. In contrast to the later President Carter years, this period is notable in that the pro-intervention hawks are Democrats, and the anti-war doves are Republicans. A revolt breaks out in the Dominican Republic in 1965 and it takes a landing by US marines and occupation by them and other states from the Americas to bring about a free and fair election in 1966. The 'Dominican Intervention' is largely driven by a fear of the communist threat. 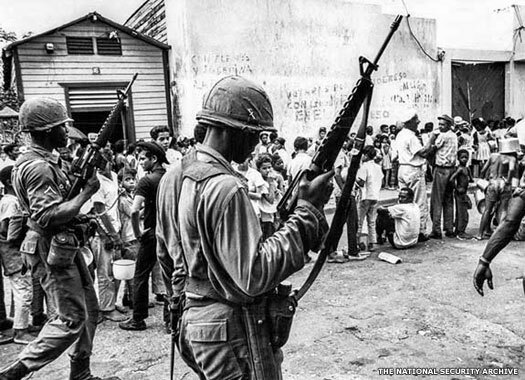 Following the 'Dominican Intervention' by US and other troops, those same US troops now patrol the streets near a food line in Santo Domingo on 5 May 1965, during the Dominican Crisis. Heavily involved now in Vietnam, US forces also find themselves becoming involved in Laos and Cambodia. The latter is plunged into civil war in 1970 when Prime Minister Lon Nol mounts a successful coup against King Sihanouk and then his new government is forced to fight against the Khmer Rouge guerrilla forces. The republic falls after Phnom Penh is captured. However, the leader of the North Vietnamese forces, Ho Chi Minh has already died (in 1969) and President Nixon has begun to reduce US ground troops in Vietnam as domestic public opposition to the war grows. US troops complete their withdrawal by 1975. The US hands back the Swan Islands to Honduras on 1 September 1972. Then a US-backed coup deposes the democratically-elected president of Chile on 11 September 1973, which allows the creation to take place in 1974 of a dictatorship under Augusto Pinochet. The US and Panama agree the Torrijos-Carter Treaties which will eventually return ownership of the Panama Canal to Panama itself. Torrijos himself steps down in the following as military dictator of Panama, but pulls the stings of his 'elected' president. Republican, California. Ex-actor. Served two terms. The First Gulf War is triggered when Kuwait is occupied by Iraq. A United Nations coalition army is assembled in Saudi Arabia under the overall direction of the USA to force them out, with heavy Iraqi losses. Democrat, Arkansas. Served two terms. An exodus of people in 1994 to the USA follows problems in Cuba. The fall of Soviet Russia has dealt the country a heavy economic blow, as this had been its only source of oil and cheap foodstuffs. In the same year, the US lifts its thirty-year trade embargo on Vietnam, and the following year restores full diplomatic relations. On the very last day of the year, as part of the Torrijos-Carter Treaties, the US hands full control of the Panama Canal to Panama. This time the US is able to deal with Mireya Moscoso, the country's first female president and the winner of a democratically-free and fair election. Republican, Texas. Son of George H W Bush. Served two terms. Terrorist attacks take place on 11 September when four passenger planes are hijacked. Two of them are crashed into and destroy both of the Twin Towers in New York, while another plane hits the Pentagon. The fourth plane crashes in open fields after the passengers fight back. In Afghanistan, the Taliban refuse to hand over terrorist leader and overall organiser of the attack, Osama bin Laden, who is taking refuge there. An invasion is launched, with some US forces being allowed the use of a base in Uzbekistan. By November 2001 the Taliban have been pushed out of Kabul and into the eastern fringes of the country by US and British air strikes and a resurgent native northern alliance. An Anglo-American-led action forces the collapse of Iraq's dictatorial regime after just twenty-one days of fighting. Fighting to make the country secure afterwards takes much longer, as militant bombers and factional divides threaten to destabilise it completely. There is a second exodus of Cubans to the USA, although not as large as previously. Conditions in Cuba are slowly changing as the old guard ages and fades in power. President Fidel Castro is forced by ill health to retire in 2006. Dem. Son of Kenyan man & Anglo-Irish US woman. Served 2 terms.